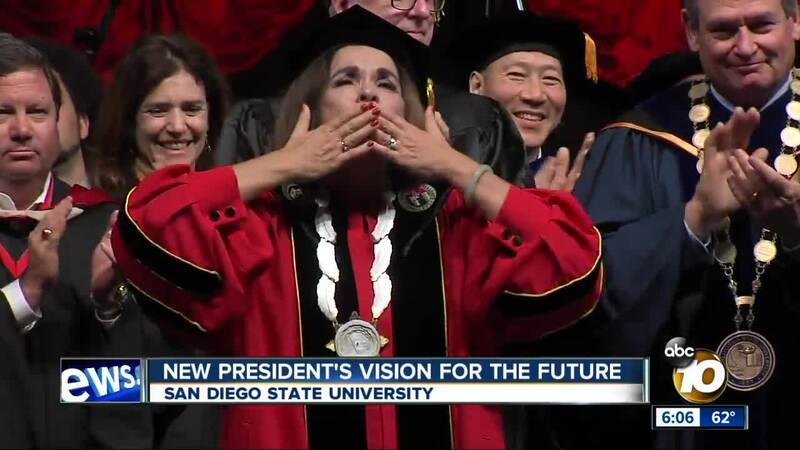 SAN DIEGO (KGTV)- San Diego State University held an inauguration for their new president. Dr. Adela de la Torre is the ninth president for SDSU but the first female president. She was appointed in 2018. During her speech she said, “I know I stand here as first woman to serve as permanent president to lead this university, but I recognize that I stand on the shoulders of women who have shaped the identity of SDSU from the very beginning”. Looking at the coming years, she says there is critical work that needs to be done. Further, she explains her support for SDSU West and her plans to expand SDSU Imperial Valley, “we will continue to capitalize on its untapped potential,” she says.